The triumphs and tragedies of Brian Wilson’s life have been well-documented and recorded, from his work as a hit-making singer-songwriter with The Beach Boys to his vastly influential orchestration of studio albums like Pet Sounds and Smile to a descent into drugs, both prescribed and recreational, that took a heavy toll on his body and his fragile psyche. Bill Pohlad’s unconventional new biopic Love & Mercy tackles this dichotomy by harmonizing two eras of Wilson’s life: The 1960s, when he abandoned The Beach Boys’ pop formula in favor of the studio symphonies of Pet Sounds, and the 1980s, when the reclusive genius emerged from the toxic influence of psychiatrist Eugene Landy with the help of his future wife, Melinda Ledbetter. In the 1960s scenes, Wilson is played by Paul Dano; in the 1980s, he’s played by John Cusack. Since Love & Mercy debuted at the Toronto International Film Festival in September 2014, Wilson has thrown his support behind the film and aided the publicity campaign, despite the physical and mental stresses and his well-known reticence to doing press. During a recent screening event at the Music Box Theatre in Chicago, where Wilson was greeted with a standing ovation, he and Cusack talked to The Dissolve about their relationship in the lead-up to making the film, Wilson’s brilliance as a studio maestro, and the film’s importance to Wilson as a cautionary tale. The Dissolve: What’s it been like for the two of you touring behind the film and bringing it into the world? Brian Wilson: Well, I didn’t have a hand in the making of the movie, but I got to know John and Paul Dano, and I gave them my mannerisms and some of my personality aspects for about a week, and then after that, I don’t know what the hell. John Cusack: We had more than that. We had all of your music. And then we got to talk to Melinda, and we talked to Brian. Brian came by the set a couple of times. He was inspiring us the whole time. He did all the work because he lived his life and did his art, and we had to do the work to try to capture it. But Bill Pohlad, he worked real hard on it. All the actors really worked hard. Everybody on that movie gave it their all. People were into it, man. It was cool. The Dissolve [to Wilson]: Did you see the screenplay before it was produced? Was there basic facts about the film that you knew and approved of going in? Wilson: The part where Dr. Landy… I was in a nine-year program with Dr. Landy. I actually couldn’t tell the difference between [Paul Giamatti] and the actual Dr. Landy. It was the way he talked, the way he yelled, the way he stomped his foot, the way he smoked. He was so much like Landy. 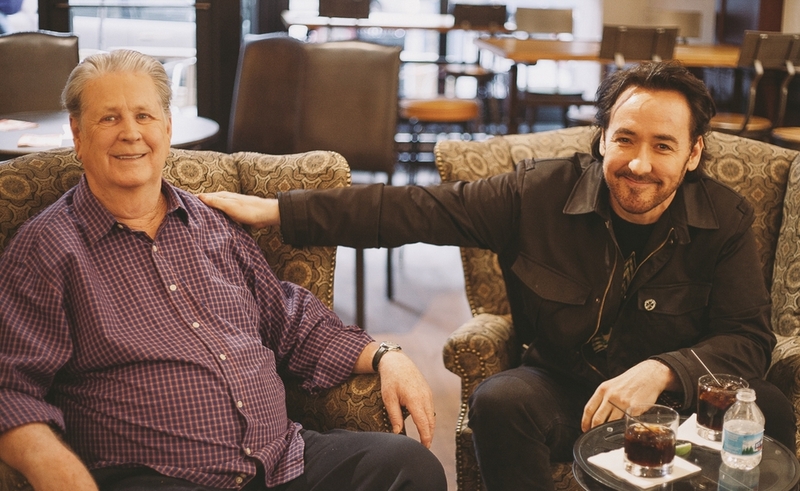 The Dissolve: [To Cusack] What sort of insights into Brian were you looking to glean by spending time with him? What sort of conversations did you have? Cusack: You could make a whole miniseries on Brian’s life and fill it. You could do 20 hours, but I had to do a part of his life when he was past his creative apex, and re-entered [society] and fell in love with Melinda, and came back to rise up again. We had to pick certain areas to do. I wanted to understand what was going on with him emotionally and what was going on with Landy, and what the dynamic was like, because I didn’t want to get that wrong. From the outside, it was hard to understand. I was able to talk to some people. You don’t want to ask Brian to re-live everything he’s lived in his life, but if we’re going to make a movie about it, I had to ask him. The Dissolve: Do the two eras harmonize for you? How aware were you of that other side of things? Was there any coordination with Paul? Cusack: No, there wasn’t as much coordination with Paul, because the conceit of the movie is, we have two actors playing the same man. We were saying, “There can be no one definitive portrait.” There is Paul playing part of him. I’m playing part of him. You can have four different versions of the same mother, right? But we wanted to go by feel, and the creative apex he reached in American history was unparalleled with Pet Sounds and Smile. That was the music that I tied into. To me, when he came back to play Smile at the Royal Albert Hall after re-releasing this masterpiece that had not been heard and seen, that was the connection for me. Paul and I were connected always through the music. The Dissolve: How did listening to the music help you gain insight into who he is as a person? Cusack: Have you heard the Smile Sessions and Pet Sound Sessions? When you hear that, you will understand, because they’re a treasure-trove. You hear him creating. He’ll take one layer and then put on another layer of vocal, and then another layer, and then you’ll hear him start to put a track together. And he had to imagine all this sound before it came into the room, because you can’t hit a button and go Pro Tools on it. You have to have a trombone, five tubas, you have to have orchestras in there, right? The Dissolve: That was one of the things I really like about the movie. The documentary about the Wrecking Crew supports this, too. These sessions, which seem to have been painstaking and arduous, were also joyful and fun. Do you feel like the film got that right about how you felt, Brian? Wilson: I felt scared. I felt a lot of anxiety, because I knew that if I didn’t get the band to sound good, then I was a loser. If I could get them to sound good, then I was a winner. I thought, “I’m not going to be a loser. I’ll be a winner.” So I went in there and I gave them their chord sheets, and “God Only Knows” came in 15 minutes. The Dissolve: Other tracks took longer to put together, I assume? Cusack: You can hear them in the sessions, because the musicians don’t quite know what he’s doing yet, and you can hear them start to build. No one knows exactly what they’re doing except Brian, who has it all in his head, and then he’s getting everything just right. [To Wilson] You made everybody feel good and you were like, “C’mon, let’s make it. Let’s do it.” He was in total control. It seemed to be. I’m sure you had anxiety about it. The Dissolve: It seems like musicians really enjoyed the process. Cusack: Every musician I’ve ever seen interviewed says there’s no one like Brian in the studio ever in history. They say he’s the best. It’s true. The Dissolve: [To Wilson] How well does the film capture the tensions within the band when you were working on Pet Sounds? There’s a lot of push-and-pull between The Beach Boys being this huge commercial enterprise and you having a much different vision. Did you feel that was portrayed well in the film? Wilson: Well, the guy that played Mike [Love] [Jake Abel] was very close to how Mike actually is. The movie itself took, what, about a year? Cusack: Yeah, it’s been about a year. Wilson: The rest was what it was. The Smile sessions, we did in 1967. We put it on the shelf until 2004, and we started writing a third movement to it. And then we had three movements. And then me and Van Dyke [Parks] said, “That’s enough movements.” So we had the three movements: one, Early America, two, Mid-America, and three, Hawaii. So it covered a timespan of 1770 to 2004. The Dissolve: [To Cusack] Bill Pohlad has an impressive list of credits as a producer, but this was his first time directing since 1990. Was there an adjustment period for him, particularly in dealing with actors? How would you describe his style? The Dissolve: What sort of trepidation did you have when you finished the film, and Brian got to take a look at it? Wilson: He was nervous. He was smoking. Cusack: I was on my phone waiting for a text, and I saved the text when I heard what Brian thought about it. But I went to go see him in L.A. at some places that they know, and I’ve seen them since. Everyone’s worked hard on it. And I think you and Melinda are happy with the film, wouldn’t you say? Cusack: And that’s what Bill and Paul and Elizabeth [Banks] and Oren wanted. Everybody worked so hard on it. The Dissolve: [To Wilson] Do you feel the film expresses some truth about your life? Do you feel like people are going to understand you more by watching the film? Wilson: I think they’re going to identify with me and what I went through, and see the drugs I took. And that’s not going to make them want to take drugs, because if they saw what it did to me, they wouldn’t dare go near drugs. They wouldn’t even go near drugs. Nobody would. The Dissolve: Is that anti-drug message as important to you as the music in the film? Wilson: Well, I think the people would recognize most of the Beach Boys music I did. Maybe not my solo albums. But people will walk away feeling good.